On Saturday the 15th September 2018 I was privileged to be part of Donnie Edwards' 'Best Defense Foundation'. "Return of the Veterans" program. Donnie is a retired NFL football player who has spent the last 22 years giving back to our military. 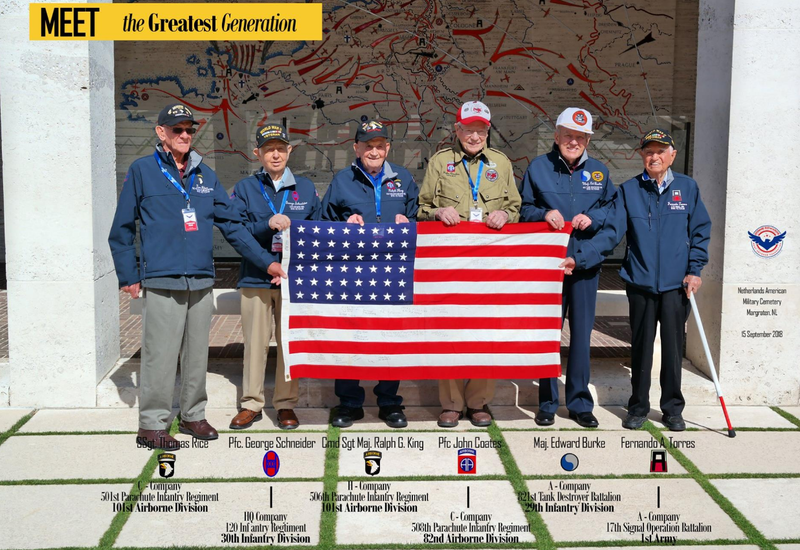 He has done numerous USO tours, visited many military bases and accompanied hundreds of WWII veterans and Vietnam veterans back to their battlefields. Donnie was the Los Angeles Chargers Salute to Service Award recipient in 2017. 5th July 2018 Gesamtschule Aachen-Brand. 29th April 2018. Guided tour Global River Cruises / Gohagan Tours, Group #2. 23rd April 2018. Guided tour Global River Cruises / Gohagan Tours, Group #1. 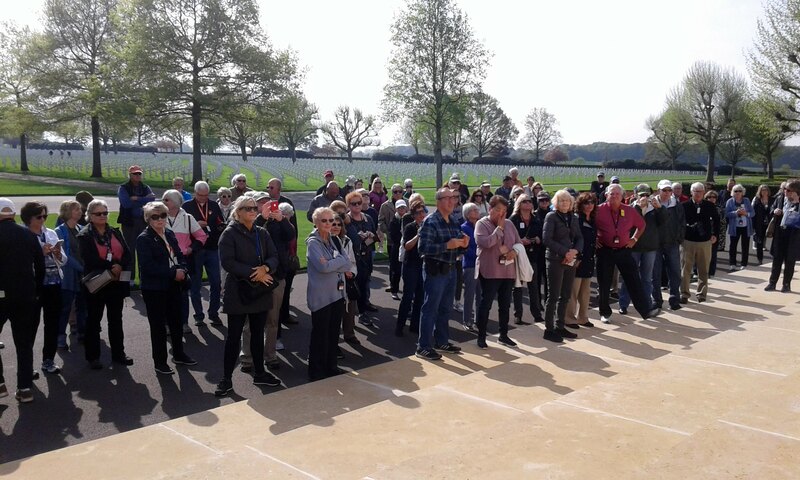 I was on your tour of the American Cemetery, from Uniworld and I want to tell you how touched I was by the whole experience! This cemetery was something I knew nothing about. I was so impressed with your stories and the work you are doing! Most of all I want to thank the Dutch people for remembering and for adopting our Military. 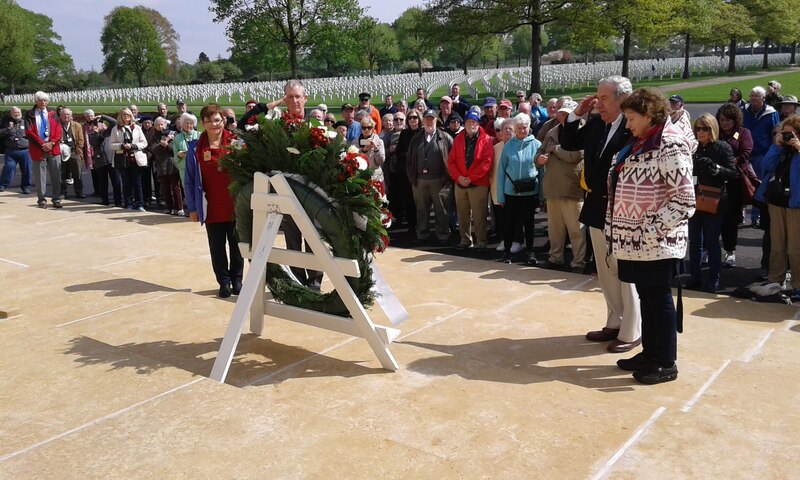 My wife and I want to thank you again for the tour of the American Cemetery on April 20. It was a very moving experience for both of us. What impressed us the most was the knowledge and passion that you expressed during the course of the tour. It is amazing that almost 75 years later the remains of those on the wall of the missing are still being discovered and identified. Also, thanks for the research that you completed on these heroes and providing us with insights into their lives. On the morning of April 13th I was part of a tour group from the River Ambassador and you were our guide. I want to congratulate you for a job that was very well done. 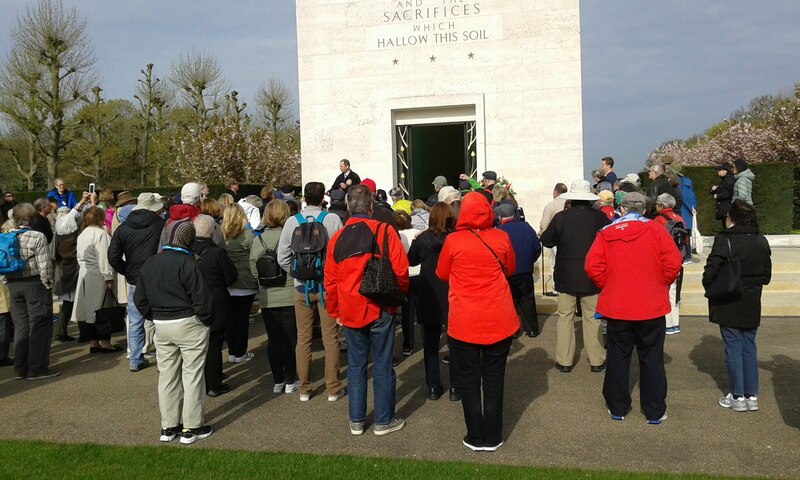 Your knowledge and personalization about some of the individuals buried there made for a very emotional experience. I have been to Normandy and Arlington Cemeteries on several occasions and to other US national cemeteries, but you made the trip to the Netherlands Cemetery the most meaningful of them all. Beach Hall, Rogers City, Michigan, USA. Photograph courtesy Mrs. Beverly Tomb. Thank you for the guided tour you gave to our little group of five travelers last week (7th April 2016). I especially want to thank you for your compassion when you learned that my father was KIA in on the island of Luzon in the Philippines. Chances are that I will never visit the land where he died and was first buried, so having you explain how our dead were handled in the Netherlands and beyond answered so many questions. I appreciated the pictures you shared, as hard as they were to see, and your sensitivity to my emotional reaction. The grief of growing up without a father still lingers even after all these years, but I feel better having walked the grounds with you. I posted a few pictures with comments on my FB page and attached one of the two of us in this note. It was impressive and very comforting also to see the way our fallen heroes continue to be honored by the meticulous care taken to maintain their sacred burial ground, and for the Netherlanders who visit the graves each year along with those who care about those who are still missing and their families, like your son. Please express my appreciation to all and thank you for keeping the memory and lessons learned alive for future generations. 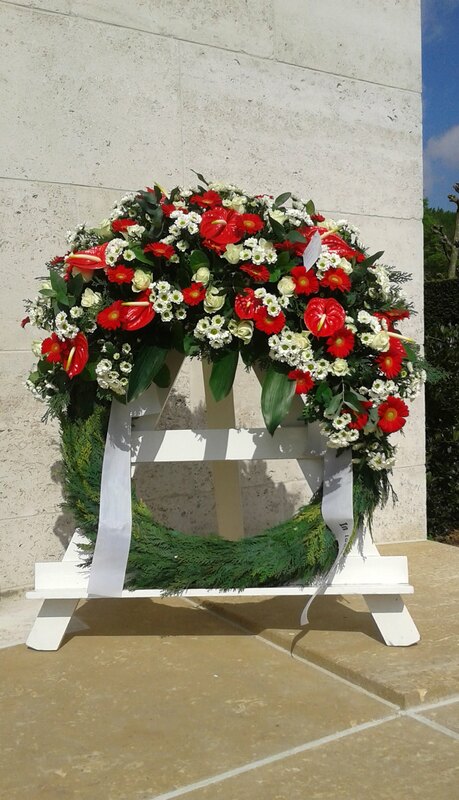 Early in 2015 my husband and I decided to make a trip to The American Cemetery in Margraten to visit the grave of his uncle who was killed near there in WWII. I visited Trip Adviser to see how this could be done and found your information as a highly recommended guide. On September 3, 2015 we were able to make this happen. Arie, we want to thank you so very much for making this trip such an easy, memorable one. Not only did you give us an amazing tour filled with history of the cemetery and the battles around it but you also provided us with information about the activities of Fred's unit before he was killed. Your personal touch about Fred and others who were killed defending freedom brought so much meaning to the day and is something we will never forget. difficulties about 10 miles away from our meeting station. We had no idea how we were going to get there. When I called to let you know you told us to wait and you would come get us there. Not only did you drive to pick us up but you were kind enough to take a friend we had made to his destination as well! Arie, you are a wonderful guide and have become a wonderful friend as well. Again I wanted to thank you for the tour of Margraten Cemetery you took us on. And humble appreciation for the information you provided about Fred, and the Red Horse Cavalry. Wasn't it fate that our train broke down and you were able to pick us up at the very spot the unit crossed. Thanks to you....it is something I will always remember. On 5 September 2015 my father and brother came over from the UK for a visit. I wanted to show them the cemetery because my father was in the RAF when he was a young man. I came in contact with you and what you did was absolutely amazing. Your made the tour custom made for us with lots of different stories about RAF soldiers (*). I would like to thank you so much for your special tour, your effort and your enthusiasm! -The first American who was killed over the Netherlands was attached to No.53 Squadron of RAF Coastal Command. He was killed in action while flying with a British crew and acting as an American Liason Officer. The aircraft in which he lost his life was a Lockheed Hudson, wearing British colours. -Two Americans who are commemorated on the Walls of the Missing were volunteers who had joined the British Royal Air Force before the USA was drawn into war. Both were lost (Missing in Action) while flying British Spitfires with the famous RAF Fighter Command ‘Eagle Squadrons’. - The famous 4th of July 1942 ‘Independence Day Raid’ was executed by nine RAF/USAAF crews flying American Douglas Boston aircraft loaned from the RAF Bomber Command’s No.2 Group, taking off from RAF Station Swanton Morley. On this raid one British and two American crews were lost, three RAF and five USAAF crew were killed in action and one American crew member became the first American POW of the Germans. Staff Ride / Battlefield Tour / Eindhoven area 101st Airborne Division. Netherlands American Cemetery & Memorial at Margraten. 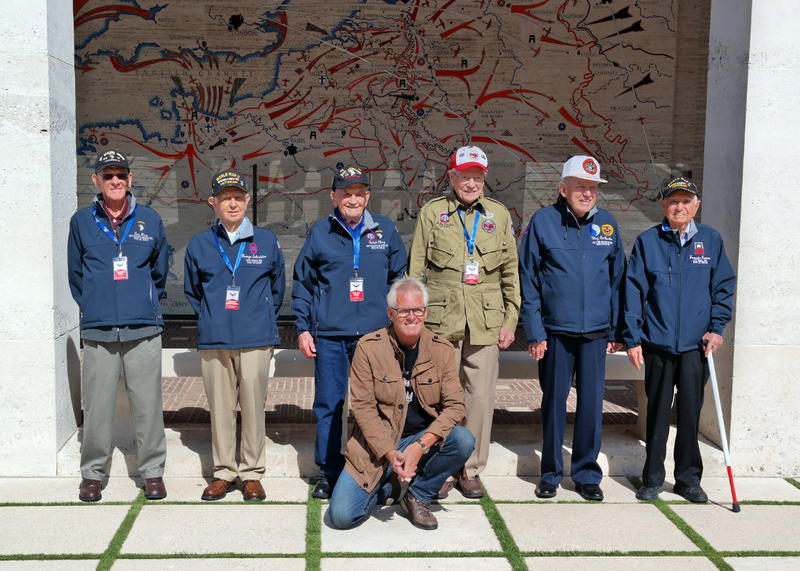 Our American military unit planned a tour event spanning across European battlefields in Luxembourg, Belgium, and the Netherlands. 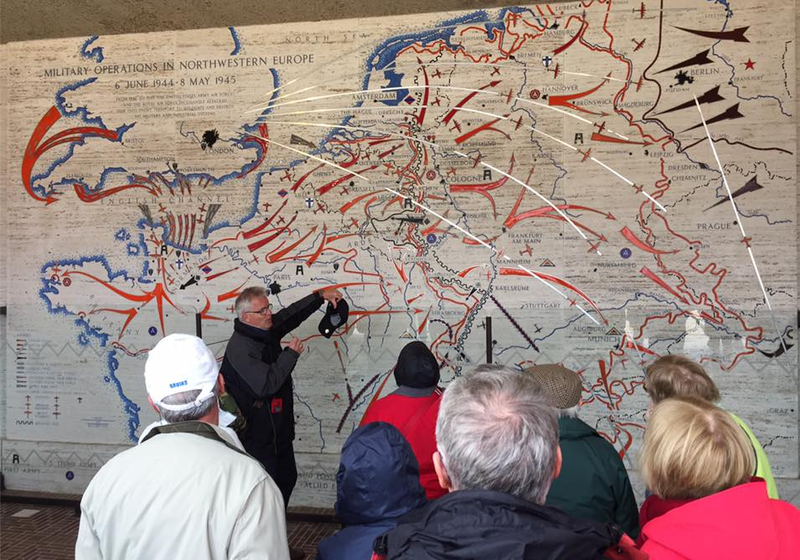 Mr. van Hees was scheduled to be our tour guide for Eindhoven and Operation Market Garden, and he did not disappoint! Arie was extremely knowledgeable of the entire Operation, and was able to pinpoint exact battle positions. In addition, he gave great impromptu tours at the Market Garden Museum (Wings of Liberation Museum) and was extremely accommodating to our constantly-changing schedule. 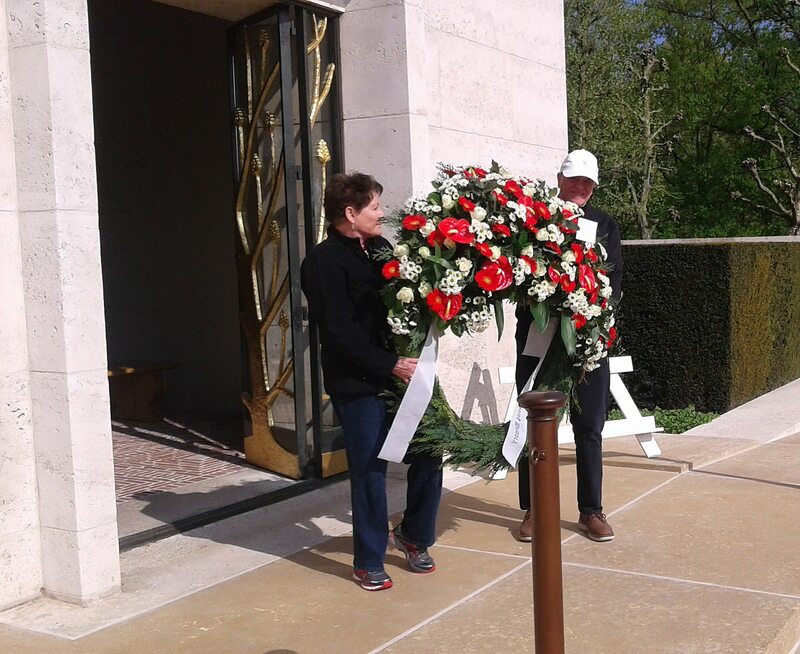 He even took time to give an extra tour at the American Military Cemetery, which was the perfect way to end our trip. We could not have been more pleased or grateful with Mr. van Hees! 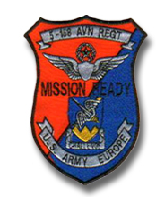 1Lt Brad M. / 5th Battalion / 158 Aviation Regiment / US Army. Hope your holiday was as rewarding and enjoyable as mine was. And thanks partially to you, who helped make our trip to the Netherlands, and in particular Margraten Cemetery, a most memorable one. And the most unexpected honor for me was meeting Dirk Schouten who is the adopter of my uncle’s gravesite, along with his wife, Corry, at the cemetery with you. Thank you so much for making the connections so that could happen. 23, 24 and 25th of May 2014. I cannot thank you enough for how much you contributed to the success and enjoyment of our trip. The word "thank you" seems so inadequate to tell you have much we appreciate what you did for us. You were a GREAT guide and an even better person. Alison and I both enjoyed getting to know you. You listened to what was of interest to us - you were creative and imaginative in finding locations and describing matters of interest to us - it was evident that you worked long hours in preparing for the various tours you gave us - your information was interesting and pertinent - it was all, in a word, PERFECT. James E. "Kimo" McCormick III, Esq. Newport Beach, California, USA. Also, I wanted to thank you for your referral to Arie-Jan van Hees. We could not have had a more wonderful, personable, and knowledgeable guide. He spent two and one-half days with us allowing Alison and me to live and learn about World War 2. Through his research, he allowed me to connect with, and walk in the footsteps of, my father, Major James E. McCormick. Prior to our visit, I had sent Arie a few photographs that I was able to find that involved the cemetery and my father who was stationed in Maastricht from November 1944 through March 1945. Arie was able to pinpoint many of the same locations that were depicted in the photographs and gave us a history and tour of many of the locations used by the US 9th Army and the Quartermaster of Headquarter Company of the US 9 Army. He was both a student of history and a very good detective. In addition, Arie gave us a fascinating and educational tour of the cemetery that put faces on the crosses and told us each unique story. Without Arie's assistance, we would have missed a good part of the story and meaning of the cemetery. We are so pleased to have had this experience. We are back home in Voorburg, but I wanted to thank you again for the wonderful tour. It was wonderful to tour the cemetery and memorial with you. I hope to take my boys back again once they are old enough to understand that important part of Dutch and world history. Cynthia (Voorburg) and family (from Costa Rica). (20-10-2013). 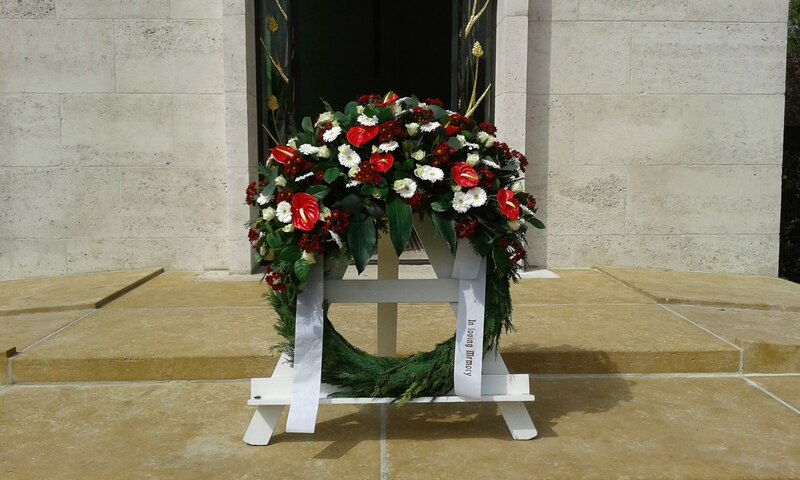 Last Saturday 8th June 2013 we as DAF Trucks visited the Netherlands American Cemetery at Margraten with 16 customers of our importer who is located in Auckland-Christchurch, New Zealand. I have received very many positive reactions, especially regarding the enthusiastic guiding of Mr Van Hees. This guided tour was very informative for them. Despite living far away from the European battlefields they have of read of the war or seen documentaries on TV. 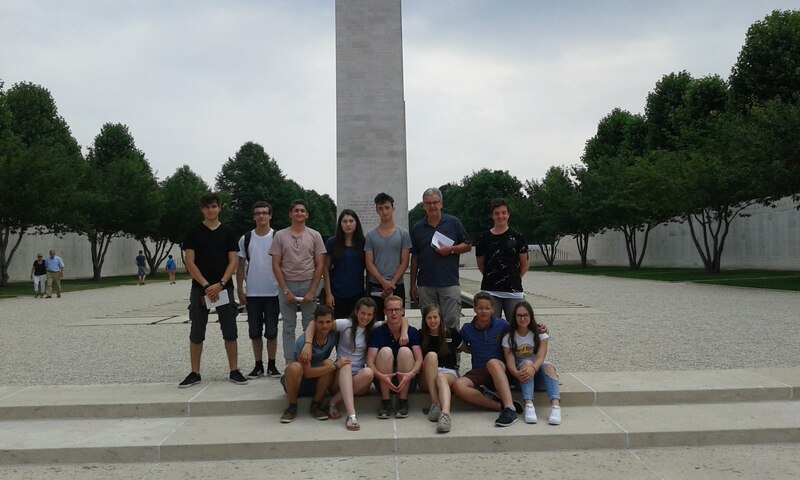 The guided tour and the visit to the cemetery was a large revelation for them, learning more about what happened in Europe and this area during the horrible second world war. Just before the closing of the cemetery Mr Van Hees arranged that two of our guests were allowed to participate in the ceremony of lowering and folding the American flag. We thank Mr Van Hees for his extensive and informative guided tour. Geert van Genugten, Area Director DAF Trucks Sales Operations. DAF Trucks, Eindhoven, The Netherlands. We arrived back to the States late last Sunday and are just now getting over jet lag. I cannot thank you enough for helping us plan for the trip to Margraten. Since learning about Captain Hunter 12 years ago, I have always felt a special bond to him as he was the first WWII veteran I researched. Visiting the place where he died was sad but knowing that there are many Dutch citizens like yourself keeping these soldiers memory alive lets me know that their sacrifice was not in vain. You really made my trip very special. When we arrived at the hotel in Margraten the 34 roses were waiting for us. At the American Cemetery one of the men of the staff escorted us to Captain Hunter's grave with a bucket of sand from Normandy which we rubbed onto the headstone so the lettering would be clear. Although we arrived rather late in the day, the cemetery staff allowed us to take our time placing all 34 roses and American flags on the graves we came to see. Thank you for helping to make these arrangements. 12 October 2012, Terry Meinke (USA). On September 6th, 2012 my wife and I had the honor to visit the Netherlands American Cemetery and Memorial in the village of Margraten, The Netherlands. We were both impressed with his complete knowledge and understanding of the facilities and of those American heroes who were interred there. He told us many life stories of the service members buried there. I would whole-heartily recommend Mr. Arie-Jan van Hees as an extremely well informed and competent tour guide. Barton J. Gilbert, Brigadier General US Army (Retired).